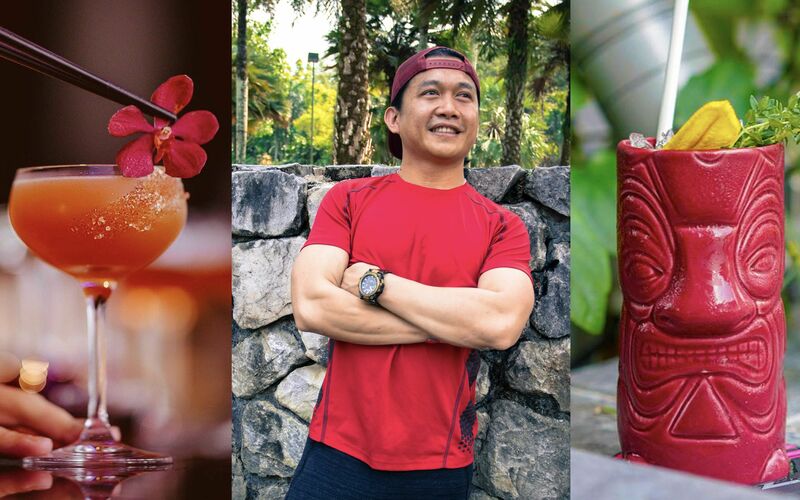 Those who believe that cocktails and health occupy opposite ends of the spectrum have yet to meet Riizal Junior Joe Utto, head bartender at the W Kuala Lumpur. While long, erratic hours in F&B lead to industry personnel overlooking their wellbeing, JR stands by the saying, "Your health is an investment, not an expense." Fitness hadn't always been high in JR's list of priorities, but the Sabahan quit smoking in 2009 and completely turned his lifestyle around in 2011. "I told myself that if I wanted to continue my lifestyle, I would have to balance it with exercise and a good diet," he said. That way, I can continue doing what I love until the day I retire. More than 15 years behind the bar (he's worked at the Nexus Resort Karambunai, Kota Kinabalu; Qba at The Westin Kuala Lumpur; Elixir Club; View Rooftop Bar at G Tower Hotel; and the Marinis Group for various stretches at a time) have enabled JR to make keen observations on his kind. "Bartenders are prone to getting lower back problems because we often hunch over when using our cocktail shakers," he pointed out. "I've learned to keep a straight back. Always." He often reminds his colleagues that it's crucial to practice cardio. "We consume alcohol almost every day, even if it’s through small tastings. Cardio helps to strengthen the heart and lungs while burning calories. It heightens our focus and energy levels for working into the wee hours of the morn." If you already know how to execute the squat, take it up two notches by spreading your legs wider (like a sumo wrestler's stance) and adding resistance. Grab each end of the band and step on the middle with your toes pointing outwards. Clasp your hands together as if to say a prayer. Squat low enough for your thighs to come parallel with the ground. Rise to standing position without locking your kneecaps. Repeat the squat and rise motion. Enjoy the burn. You don't need a body of water to enjoy the benefits of rowing. Begin in a seated position with both legs stretched out in front of you; your form should resemble an L. Place the centre of the band around the soles of your feet and make a loop around each foot to increase the resistance. Sit tall and hold your abs taut. Tug the handles of the resistance band forwards towards your ears before releasing and straightening your arms. Later, repeat the movements but bring your hands towards your core instead. The first range of movements work your upper back whereas the latter target your lower back. Sit on the ground or your mat with both legs stretched out in front. Position the dip stands on either side of you, about half a foot's distance from your hips. Grip the handles of the stands and dig your heels into the ground. Push your body off the ground by bending your elbows. Repeat. Lie low with your chest touching the ground. Position your hands directly beneath your chest with your fingers facing inwards. Dig your toes into the ground and push yourself upwards using only your arm strength. Your body should remain as straight as a plank the entire time. Repeat. Assume a straight stance while keeping your feet shoulder width apart. Grip one heavy dumbbell or two medium-weighted ones with both hands behind your back. Raise both hands above your head until your arms are straight. Lower the dumbbells back down. Repeat. *Take extra care not to drop the weights, which could cause head injury.